No cinematic genre can capture the inky morality of pernicious scavengers feeding on the carcass of post-war Europe like film noir. And no other noir manages it with quite the pervasive world-weariness and melancholy of The Third Man (1949). Beautifully penned by Graham Greene for Carol Reed’s direction, it is one of cinema’s true masterpieces: a labyrinthine search through the rubble of a defeated and desiccated Vienna; the tale of a wide-eyed American, exposed for the first time to the harsh, cruel realities of carving a bitter existence in the husk of a bombed-out continent. All the while, Reed and his cinematographer, Robert Krasker, craft an expressionistic landscape unlike any other. With much of the action actually filmed on location, Vienna is in many senses the central character and it is afforded due care and attention. An introductory narration – by Reed himself – reminisces about the city’s easy charm before the war, but there’s little of that remaining when American pulp novelist Holly Martins (Joseph Cotton) pitches into town to visit his old chum, Harry Lime. Instead, Vienna is a threatening and disorientating place, photographed at oblique angles and ensconced in shadows, both murky and marauding. Dialogue spoken in languages other than English is left unsubtitled to further bind the audience to Holly’s bewilderment as he learns that his arrival has coincided with Harry’s funeral. Bereft, he plunges into his own investigation – like any good noir protagonist should – and finds himself knee-deep in the sewerage of human existence, where everything is for sale and the cheapest commodity of all is life. Holly’s own livelihood depends on penny westerns with a straight-talking sheriff in a lawless town. He is far more ineffectual than that; a hack writer and a drunk, he begins to fall in love with Harry’s mourning gal, Anna (Alida Valli). Like the narrator’s recollections of Vienna, she is still enamoured with the memory of Harry’s sly and charismatic grin. The metaphorical reading of the man as the city is extended with the far less complementary opinion of Calloway (a fabulous Trevor Howard) – part of the British occupying force who refers to Lime as a corrosive racketeer and better off dead. But just as the unpleasant depths of Vienna rise forth from the ashes; enter Orson Welles for his famous, show-stealing cameo. Holly’s already shaking world is rocked and suddenly he’s chasing shapes in the dark, debating the value of human life with ghosts. Cotton’s inherent nice-guy persona is teasingly provoking by Welles’ schemer, an embodiment of romance and danger with a twinkle lodged in his eye from the first glorious frame in which he appears. For Martins the game concludes with the question of doing what is right, or honouring his friendship; either way he loses. But then, that is what the genre demands. Every player, barring the opportunistic Lime, longs for the past and Anton Karas’ iconic zither score sets precisely the right mood. Legend has it that Reed came across the musician in a Viennese tavern while preparing to begin filming and Karas provided the perfect accompaniment at once sprightly, suspenseful, and plangent; echoing the film to a tee. 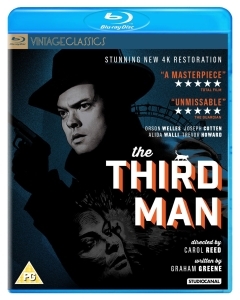 Roundly considered one of the best British films ever made – and the national qualifier is unnecessary – The Third Man is a funny, pacey, gripping yarn wound tight around a dark, desolate heart. Perfect and peerless.